examples for inspiration by a parable about making a difference in the world. 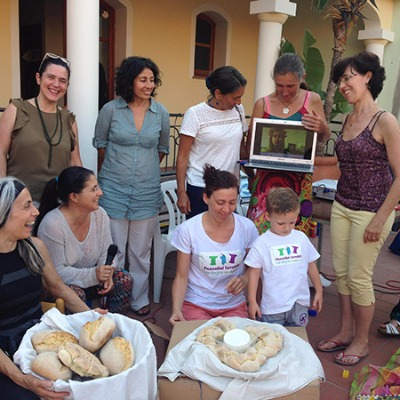 “Today for me it is a miracle, great honor and pleasure to welcome you, dear Hilda, Ruth Ehrhardt and attendees on amazing Sardinia island, to congratulate you, Hilda, with the 20 year anniversary of the volunteer work in the support of Italian women in breastfeeding, protection of women’s basic needs in pregnancy, childbirth and postpartum. 20 years of volunteering is incredible! The whole life of serving!.. “The celebration of my 20 years activism was incredible... So so moving!.. There were about 45 persons and everyone was so committed... Your video was welcomed very very well! It was so moving, Svetlana, incredible! I wished so much that you would have been there..
… when we realized that it was not possible to do the projection, I proposed to make the photo of you with us through the computer... So, Svetlana, this is what I/we can offer you as our gift of love and recognition and closeness to you! Moreover, really, Svetlana, during the meeting, when I read your message, there have been several moments in which I was so moved that I had difficulty to continue reading and many mothers cried... And someone proposed me to substitute me in reading your message... But I said, "That is so kind but no…I must read it myself!" In the photo, I wear you (on the computer) in my arms, but really, Svetlana, in that moment I felt that you were indeed with us! You can read Hilda's Garst feedback about our project here. Grateful wife and conscious mother of 2 (one homebirth), ProEstRo.com organiser and International Affairs Director, an author, a publicist, a researcher, a translator, and an interpreter. 3 key tips for aspiring doulas. How a doula could find her first clients?